Wear protection is standard only on Types 6 and 7. If you plan to use any of our other slings in damaging conditions, please specify wear pads when you order. Our padded slings include a nylon and polyester buffer designed specially for this application. They’re also available in synthetic leather that’s more economical and stiffer than regular leather or in the same material as the sling body. You may choose another material if you wish — please specify when you order. An extra layer of material is sewn at the wear points on either or both sides of the sling body or eyes. Multiple layers are also available upon request. 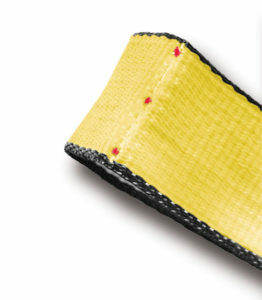 Pads are sewn along the edges of the sling body to offer extra protection at a critical wear area. Protects both sides of the sling body, and you can easily slide it across the sling. It remains stationary as the sling stretches while the load is being lifted. Similar to the sleeve, but is sewn onto the sling body to protect the edges as well as the lifting surface. To protect the finished webbing against moisture and dirt penetration, we treat all our sling webbing with a special coating during the final stages of looming to promote cohesion of the yarns in the fabric. This also helps reduce abrasion. You may also choose a coating of Neoprene if you wish. We’ll apply it after sling fabrication but it will increase the stiffness of the finished sling. The coating helps improve abrasion resistance and helps decrease absorption of fluids and dirt. Standard in all slings except Econylon™, Red-Guard web features inner, load-bearing yarns that carry over 80% of the load. When the protective outer layer of webbing is worn away or damaged, it exposes the red yarns of the inner layer to give you a telltale warning. If visible, remove sling from service immediately.